Over 110 million in the US have a smartphone. My article on Nielsen smartphone data shows just how fast the revolution is moving. Not only is there a growing number of smart phone purchasers in US, but their usage behavior is more in line with early adopter tendencies than ever before. They’re willing to upgrade and place a priority on having the latest features. 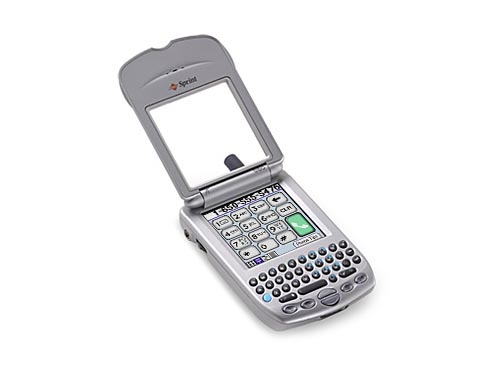 I’m writing this one month after the iPhone 5 and iOS 6 launch. Let’s look at some staggering numbers. In 2001, one year after Windows XP was launched only 14% of users had upgraded to the latest Microsoft software offering. In the first month over 60% of iOS users have upgraded to iOS 6 – a month old operating system with well-documented issues and bugs common to new software releases. That’s tens of millions people willing to risk the functionality of a device more important than their wallets so they can have the latest. Today’s early adopters are not the fringe, they are becoming the majority. Your mobile customer is an early adopter and a recent Nielsen study helps define their behavior. This Nielsen study published by Cars.com surveyed 1,500 recent automotive purchasers and intenders. 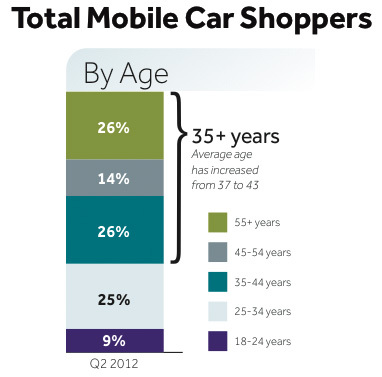 Of Nielsen’s survey the average age of mobile car purchasers and intenders was 43. Further, a full 66% of those surveyed were over the age of 35. In fact, 26% of this grouping was made up of individuals over the age of 55. The study finds that among new car purchasers, the majority “paid price or planning to pay price” was between $20k and $40k. Used car purchasers cited the $10k to $15k range most, with certified used car purchasers/intenders one bracket up at $15k to $20k. The study found that while computers, tablets, and smartphones were used in all stages of the purchase process, different devices were used more commonly in certain phases. Desktops/laptops were favored early in the process during the research phase while mobile was more often tied to activities closer to the purchase stage. Interestingly the study found that among shoppers that used both websites and apps in their purchase process, nearly double those surveyed preferred apps over websites when using a mobile phone. The study found that shoppers used apps most for contacting or locating a dealership, sharing aspects of the shopping process, and writing reviews. The study found that nearly 2/3rds of intenders had narrowed down their dealership choice since they first accessed an automotive website or app from their device. This is one of the most interesting finds in the study. After using their mobile device, two thirds of intenders had made the decision from which dealership to purchase their vehicle! In summary, your customer is increasingly utilizing mobile during their automotive shopping experience. They’re not afraid of using new tools to enhance their shopping efficiency. What steps has your dealership taken to create a mobile marketing strategy? Mobile will continue to grow, and it is important for each of us to understand the patterns of our car shoppers on their smartphones AND tablets. Fish where the fish are, make sure you have a strong mobile site, that you have mobile SEM in place, and that you complete your due diligence on any mobile solutions you implement. Thanks for the great contribution Ben! Kevin, great points as always. As this is a third party study and I have no additional data on your comment points, I can only offer possible explanations from my own observations and experiences. Mobile shoppers ALWAYS access a dealer’s mobile site first during their initial search. They do not FIRST search the app store to locate a dealership app. It just doesn’t happen. I think this agrees with your point, Kevin. The study states, however, that “shoppers used apps MOST for contacting or locating a dealership” and found that they prefer using apps while performing these tasks. 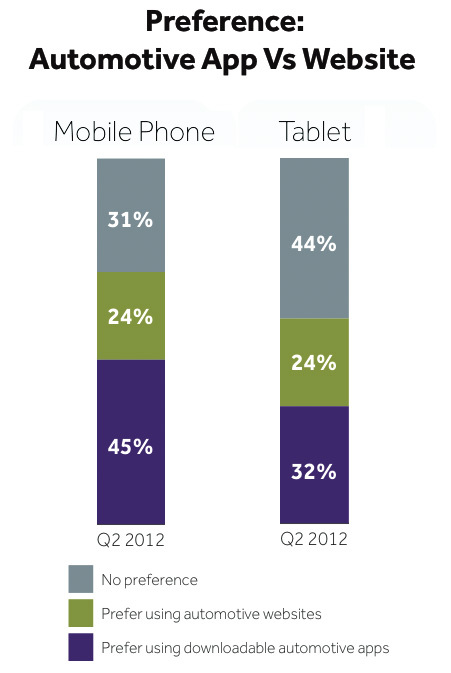 Note the study doesn’t state WHEN the customer used apps vs. the dealer’s mobile site. Here’s my experience on this topic. Our best dealers are using “app option” code on their sites to identify when an iPhone or Android user is visiting. This code then offers the user a dealer mobile app to assist in their shopping process. Therefore, an initial mobile site visit leads to an app download. Here’s where the “shoppers used apps most” explanation comes in. Once that app icon is installed on the customer’s phone, we find that shoppers open the app to search inventory more often during the shopping process. The ability to open an app and access inventory in seconds has a convince advantage over opening a mobile browser, typing in a keyword search, and find a dealer’s site. The problem is shoppers rarely bookmark a dealer mobile site and therefore tend to repeat a Google search every time they’re searching for current inventory. An app, in a way, is a forced bookmark that resides on the customer’s smartphone home screen and allows the shopper quicker, easier, access to inventory, dealer contact info, and directions when they’re ready to visit the store. As a result, I think the study is stating that shoppers used apps “most” rather than “first” – essentially finding that shoppers went back the app more often during this stage of the shopping process. Disclaimer: the above is simply a suggested explanation on the study’s findings. It would be great to get other’s comments on this topic! I think that the line between app and website is becoming more blurred. People think a website is an app, and some even look like such on a mobile device. Esp on some sites that are extremely mobile friendly. “Prefer to use downloadable automotive app” in the study tells me that the sites being designed right now are not REALLY mobile and multiple size friendly – or the consumer wouldn’t care. Re: Google — doesn’t want the user to use an app — and while “do no evil” comes to mind… think about what Google looses when they do. And then think why they would downplay the importance of an app. Studies can be interpreted and refined for data in multiple ways – pay attention and find out what works for you. I don’t personally see the point in a dealer app – just my few cents. This only talks about those users that did download the app and thus use both. A more relevant question would be: What is the % of customers that download the app when wanting to visit the dealership site. Furthermore, if double the customers that were surveyed prefer the app, that does not mean they use it. I would rather see usage numbers then survey results that will be biased. In addition, this means that one third of your customers that did download the app, actually preferred to go back to search. As Kevin and Drew point out, I think the line between a dealer app, searching Google or yet a third option to simply teaching your customers to bookmark your site on their phone and saving it on their phone desktop are all seen as the same to the consumer. Some of our customers’ families drive 4 or 5 different brand vehicles which would mean they need an app for each dealership? Would you download an app for each grocery store you go to? Remember we go to the grocery store almost daily and a dealer site maybe once or a couple of times a year? I haven’t tried buying a car using a Phone App and this is the first time that I’ve seen one so far. I’d like to see how it works. Online shopping would be another thing for me to venture on.